Large institutional customers today pay close attention to durability, ease of maintenance and value for money. To meet these concerns, modern asphalt roofing systems provide a highly cost-effective life-cycle ratio, particularly when building modern open-plan designs. Long life is assured with an asphalt mastic roof. We can provide a 20 year insurance guarantee - however, independent studies have shown that polymer roofing systems have a life expectancy in excess of 50 years. You can depend on Premier Mastic Asphalt for a high quality and standard to stand the test of time. Mastic asphalt is the ultimate protection for a wide range of construction materials, offering total waterproofing integrity. Even in today's fast-track building industry, polymer-modified mastic asphalt remains the unrivalled choice for many designers and specifiers. Installation is carried out only by qualified operatives who have completed the mastic asphalt industry's extensive training programme. The industry can therefore offer comprehensive guarantees on both labour and materials. However, the choice is yours, as some of our customers have successfully installed built-up felt roofing or single-ply roofing to meet their particular needs. Whatever your choice, PMA has an outstanding reputation for both high quality materials and a customer service and workmanship that are second to none and highly dependable. 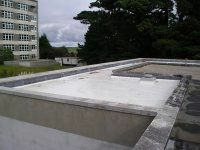 So, when you need all roofing maintenance in Plymouth or beyond remember Premier Mastic Asphalt. Don't hesitate to get in touch with us today to see how we can help you with institutional sector roofing in Cornwall or throughout the local areas.